What goes on behind a waiter's poker face? Many a nervous, exasperated or curious diner has often wondered. Last week a waiter took off his uniform and tried to tell. What he had to say was disappointing. 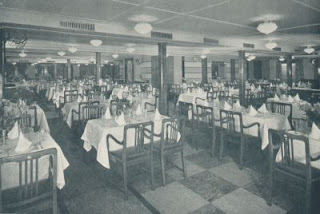 Thirty-year-old Dave Marlowe (real name: Arthur Timmens) has been a ship's steward on British and U. S. liners, a waiter in New York speakeasies and night clubs, has worked in swanky London hotels, in rowdy pubs. But apparently he paid as little attention to the guests as they paid to him. As a ship's steward his main concern was with bootlegging and his amusements on shore. As a speak-easy and night-club waiter he was mostly interested in the gangster clientele, one of whom he saw shot down one night. Waiter Marlowe found it hard to get used to the poor wages and strait-jacket discipline of English waiters, but harder to stomach the double-dyed snobbery of his fellows, the hyper-finickiness of aged guests. He was mighty glad to go to sea again. Three months after her maiden voyage he made a trip on the Queen Mary. It was his hardest job. Eighteen-hour shifts, plus the teeth-rattling vibration in crew quarters directly over the propellers, made him pine for land once more. For most guests Author Marlowe shows astonishing tolerance. (After a charity ball in London, which kept him on his feet 19 hours at a halfpenny an hour, he could still spare a sympathetic thought for the hangovers in store for the revelers.) Main bane of waiters, says Marlowe, is tipping. On this practice he lays most of the blame for the miserable working conditions of the profession generally. Do waiters judge a man's character by the size of his tip? Says Waiter Marlowe: They do. Arriving in Manhattan last week, Author Marlowe revealed that he has banked $5,000 since his book appeared, has contracts for two more, and will never wait on another table as long as he lives.